If you are submitting your education resume online, it will most likely pass through one of the applicant tracking systems. 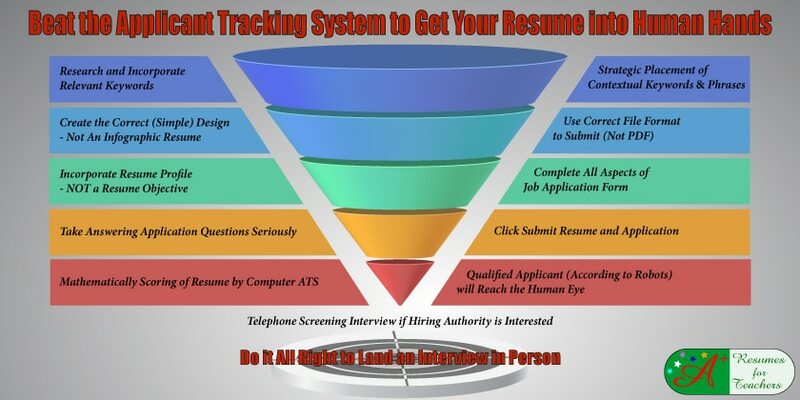 An applicant tracking system (ATS) does most of the work that a human resources specialist used to do. It scans job application documents looking for select information and particular words. 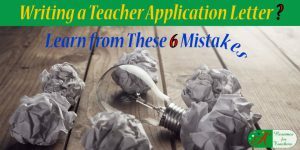 The system and software scan job application documents for teachers or administrators looking for select information and particular words. 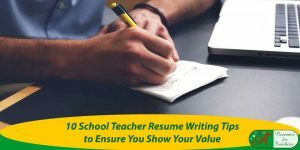 It’s essential you incorporate the correct education keywords throughout your school administrator or teacher resume and cover letter to make sure it passes the electronic test and makes it to human eyes. 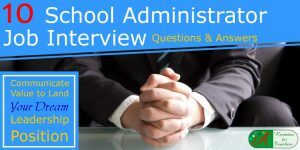 You may have the top credentials out of any of your peers; however if the school district uses one of the applicant tracking systems and your job application documents aren’t full of keywords, chances are slim you will be offered a job interview. In some ways, it is unfair that this is how potential teaching job candidates selected for an education interview, but with the increased pressures and responsibilities that everyone faces in their jobs, technology has become the way to go. Screening applicants this way provides relief to the human resources department, while (hopefully) selecting the best candidates for the position. As well, since most applications are submitted online, it only makes sense that an ATS is used to streamline the recruiting process. 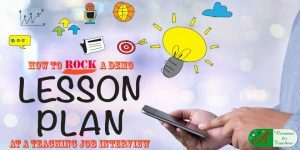 Most of the time when you come across an education job advertisement, you will be directed to a website or online portal to submit your application. 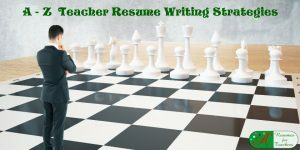 You will fill out various fields and forms and will be asked to either submit your searchable online text version resume and cover letter as an attachment or copy and paste your documents into provided fields. It is within these areas that you must incorporate keywords to make it past the applicant tracking systems. Another point to note: if you are asked to copy and paste your job documents right into the electronic application, make sure they are online-friendly and do not use strange symbols; thus allowing them to convert and display correctly. Keywords can change over time, as they are usually educational buzzwords that demonstrate the job candidate is knowledgeable of trends in education, remains up-to-date on effective teaching techniques, and stays on top of their professional development. You will note that some of the above examples are traditional topics (i.e. classroom management), while others are current buzzwords (i.e. 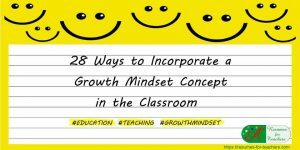 growth mindset) – this demonstrates a healthy blend of proven techniques and new, innovative methods. Furthermore, this is not an exhaustive list, but one to get you started. Don’t underestimate the importance of including keywords in your education CV or resume. Discovering current education keywords to get past the applicant tracking systems. If you are looking for additional current keywords, check out popular online education sites such as Edutopia. Locate keywords in the titles of professional development courses, seminars, workshops, and in-services that you have attended. If authoritative educators are presenting these, you should get current keywords. It is not necessary to use all of the keywords, but you must incorporate some relevant to your background and knowledge area. Other education keywords to keep in mind when you are trying to make it through applicant tracking systems will focus on your education and credentials. 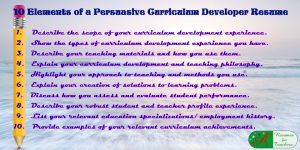 These should be highlighted in your resume and application letter for teaching, and can easily be inputted into the online job application or form. Even though the use of keywords is important, whether your resume goes through human hands, an ATS, or a combination, they are not the only thing you should focus on when writing your resume. 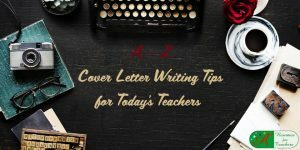 Writing a solid resume and cover letter to portray your credentials, experience, and skills in the right light are still paramount. These two job search documents should convey passion, enthusiasm, and drive. Keywords can be incorporated in the profile or introductory paragraph of your resume, as well as throughout your instructional cover letter. Again, not all of these traits need to be integrated into your job applications documents, and not all may apply to you. Try to highlight at least some of the above characteristics in your resume and cover letter, as well as during your teacher job interview. Educational administrators want to know they are hiring well-rounded teachers, who are committed to student learning and student success, and are willing to collaborate to learn and grow along the way, to make this happen. Partner with us if you need help with your important resume writing project. For 16 years, the teacher resumes we create for clients get results, even in a tough job market. 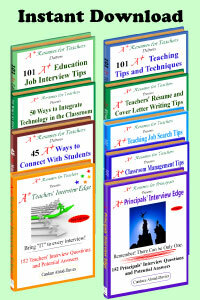 Review our resume writing services or check out our eBook store. 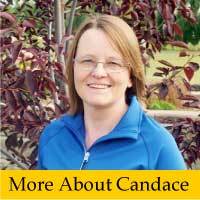 If you require more information or have any questions – email Candace or call toll-free 1-877-738-8052.